Opposition parties held a protest demonstration outside the Election Commission of Pakistan (ECP) in Islamabad on Wednesday against alleged rigging in the July 25 general elections. PML-N Chairman Shahbaz Sharif, however, was not in attendance. The PML-N chairman could not fly to Islamabad from Lahore due to bad weather, said party spokesperson Marriyum Aurangzeb. 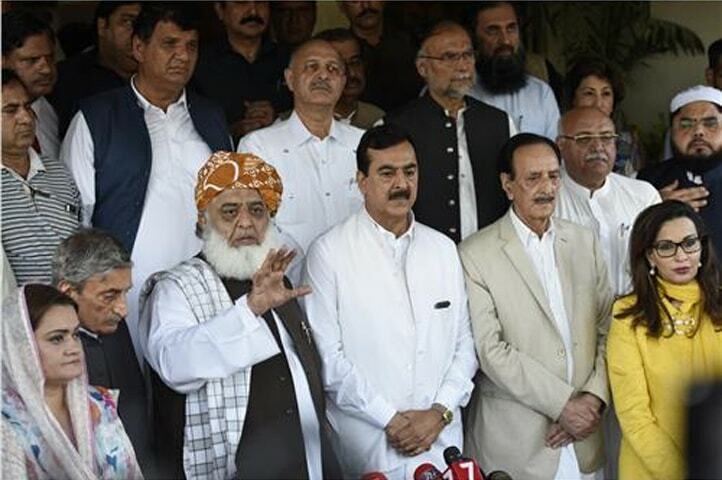 Apart from the Pakistan Peoples Party (PPP) and the Pakistan Muslim League-Nawaz (PML-N), the opposition alliance comprises Awami National Party (ANP), Qaumi Watan Party (QWP), Pakhtunkhwa Milli Awami Party (PkMAP), National Party (NP) and Muttahida Majlis-i-Amal (MMA). Leaders of the PML-N, according to reports, refused to address the gathering when they were invited to do so. PPP’s Sherry Rehman, Khursheed Shah and Farhatullah Babar, former prime minister Yousuf Raza Gilani, and PML-N’s Ahsan Iqbal were among the leaders who took part in the protest. Workers numbering in hundreds gathered in the capital. Participants chanted slogans about their respective political parties as well as the alleged rigging. Security officials were deployed in the area to maintain law and order. The opposition leaders have also decided to register a strong protest inside and outside parliament during the first sitting of the National Assembly, which according to Caretaker Information Minister Barrister Ali Zafar on Wednesday would be called between August 12-14. The opposition alliance has also given a call for holding protests outside the offices of the provincial election commissions on Thursday. They also have a plan to hold a public meeting in Islamabad soon after Eidul Azha. The opposition parties plan to organise a “national conference on rigging” in which not only political parties but members from civil society, lawyers and journalists would also be invited.